Our new Natural Ventilation brochure for 2014 is available to download from our website. Our Natural Ventilation & Lighting brochure features a comprehensive look at the various natural ventilation & lighting solutions we offer that are ideally suited for schools, hospitals, offices, gymnasiums and commercial premises as well as many more applications. Natural energy solutions detailed include our Wind-iVent passive ventilation terminals, solar powered active stacks, controlled window and wall vent units, intelligent building control systems and natural light solutions. The brochure features recent installation pictures, technical diagrams and data, recent case studies and all the relevant testing, safety and standards information you require. 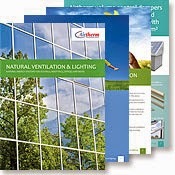 The brochure can be downloaded from our Natural Ventilation page or Downloads section at www.airtherm.co.uk. Airtherm Engineering Limited is a newly formed company with a wealth of commercial and industrial experience. We specialise in energy-efficient, eco and green technology for the ventilation and renewables market. Our solutions are aimed at the domestic, commercial and industrial sectors across a range of common applications including flue and chimney exhausts, commercial kitchen ventilation, natural ventilation and lighting, air conditioning (comfort cooling), heat pumps and solar photovoltaic (PV) panels.